The following is an email I received last year. Mike, All of you guys claim to have big fish! Why should I believe You? I am keenly aware of the bias expected from a lodge owner and that is why I rely heavily on our annual guiding statistics to provide an accurate description of the Fishery. 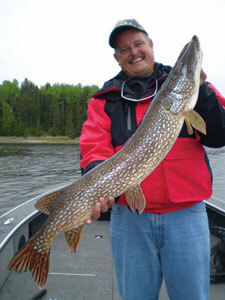 All of the guides are required to keep a log of walleyes over 18″ and pike over 30″ caught and released each day. At the end of the season, I compile all of the stats and publish them in my brochure and on my website. 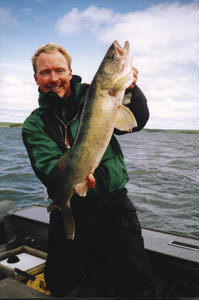 A quick glance at the 2001 walleye stats reports that 470 anglers caught and released 99 walleyes over 29 in., 590 walleyes over 27 in., and 3037 over 24 in. I became a fishing lodge owner as a means to an end. I tolerate the hassles and headaches of the business, because I am a Guide at heart. The regulations, annual repairs, paper work, and bills are all an acceptable price to pay for the thrill of guiding on a great fishery every day and the satisfaction of being part of a professional guide staff. Even after hundreds of guiding days, I still consider myself to be one of the profoundly fortunate few who truly loves what they do for a living. Part of the allure is the land itself. Northwest Ontario is one of the few remaining areas on this planet that maintains the feel of a Frontier. I could never imagine taking for granted even the smallest of its charms; the call of a loon, the taste of a freshly caught shore lunch, stunningly silent sunsets, the magical ‘tap’ of a bite that sends a lightning bolt of electricity through your arm, or just the pleasure of being alive in a beautiful natural world that is still much the same as it was hundreds of years ago.